Android cleaner tools are in demand, aWith devices being bigger than ever and the app universe is competing with ours, running your phone smoothly is harder than ever. with every touch on your smartphone, it consumes your memory in many ways and stores the garbage on your precious memory. there are many players in the cleaning market for the smartphone but most of the times we have notice it brings more problems than it solves. the cleaning apps work as an independent application and also bring a system lag every time you run it. it might be showing you its deleting 1000 of things from your phone but its mere animation than actual work. Last week in efforts of testing few of these self-claimed cleaning tools, we found the gem we were actually looking for.SD Maid is a system cleaning tool developed by a german developer (Matthias Urhahn) , we were wondering how it is actually different than all the other android cleaner apps on the android market place. Here is what the developer has to say about it.On being asked what Matthias thought of android cleaner apps which claim to “boost your phone’s battery life by 20 percent” and suchlike. DU Battery Saver PRO, a popular paid app, claims it can help you to “get up to 70% more battery life for your Android phone”. Similarly, Power Battery – Battery Saver, one of the fifty most downloaded free apps in the US, claims to improve it by as much as 60 percent. So, how does SD Maid differ from other system cleaning tools? For starters, SD Maid doesn’t have a “one-tap boost” feature. Instead, SD Maid seems more concerned with the file-removal aspect of such apps. SDMaid’s CorpseFinder function can find and delete “leftover” files, from apps which have been uninstalled, while the SystemCleaner and AppCleaner features remove “expendable” files. • Browse your whole device and manipulate any file through a full-fledged (root) file manager. • Manage all installed user and system apps. • Optimize databases by “vacuuming” them. • Do actual app cleaning, by removing expendable files, which supersedes what others may call ‘cache cleaning’. • Run all of these tools automatically on a schedule or by commencing them via widgets. 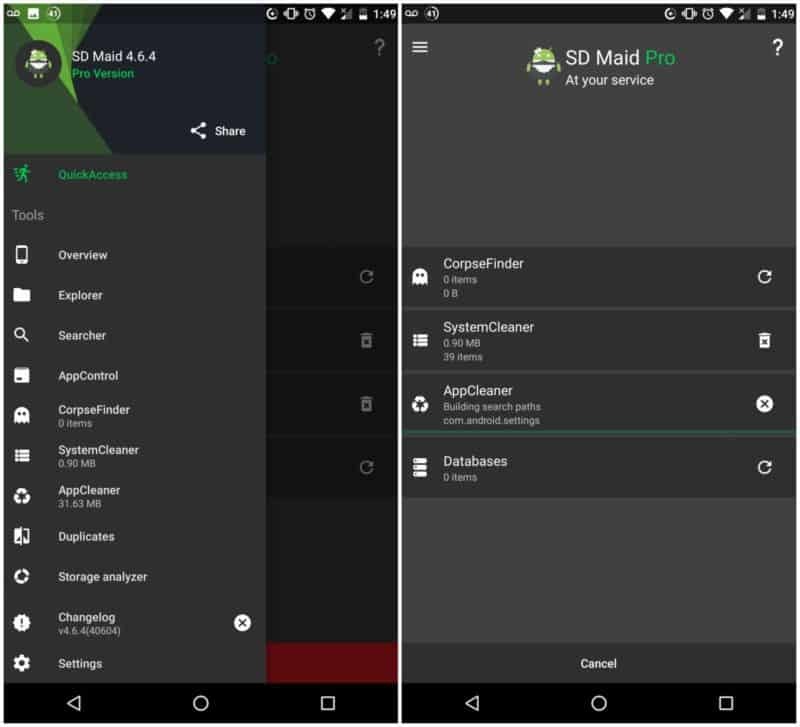 SD Maid, then, is a fundamentally different tool from a supposed one-tap battery-improving, performance-boosting, CPU-cooling app. SD Maid chiefly aims to remove unnecessary files occupying space on the device, files which users may have trouble removing without such an app’s assistance.